Sketch, design, implement and document via a portfolio an interface that creatively exploits the capabilities of a pressure-sensitive keyboard. This is an exercise in creativity, where you will design, implement, document and demonstrate an interface that creatively exploits the capabilities of a pressure-sensitive keyboard. This keyboard is an experimental Microsoft prototype - only a few are in existence today. Thus no interfaces exist (except for a few demonstrations) that use such a keyboard's capabilities. See a video illustrating the hardware. This unconventional hardware was deliberately chosen, as there is no obvious solution to how to exploit such a system. Nor are there other examples out there that you can easily copy, excepting for a few simple demonstration applications (see video) . Thus it is up to you to be as creative as possible. The hardware was developed for the ACM UIST contest, where contestants will have their systems judged at the ACM UIST Conference (October 4-. Victoria BC). We are officially entered - if suitable, we may submit our best system to the contest (there is a prize). To prepare for this assignment, you will learn techniques on: how to brainstorm and refine ideas via sketching, how to program in WPF, how to program the keyboard, how to create a portfolio entry displaying your results. 10 competing design sketches, 10 sketch details, and sketch refinements. 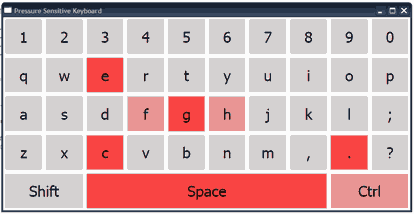 In your sketchbook, generate at least 10 competing (different) designs of a system that exploits this keyboard. Show and explain your design(s) to others. You will know which ones are the most exciting by how you talk about them and how others react. Choose the most promising one, and then produce 10 details and/or variations of a particular sketch in your sketchbook. You will be asked to briefly present your best one. As your ideas change, sketch them out. You will be asked at any time to show your sketches to the instructor, TA, and/or the class. An implemented WPF application. Implement a WPF application that demonstrates how your system works. Poster portfolio summary. Create a paper-based visual summary (it should be easy to carry and show, e.g., no larger than 18x24) that illustrates your system. Provide a title, minimal text (perhaps as annotations), and visuals that reveal what this is about. Emphasize the visuals over text - let it tell its own story. Don't feel bound to flat paper or a poster - you can have things unfold, have set of pages, overlays, use a box or other packaging, re-purpose stationary and art materials, etc. Have impact. Homework: You begin sketching 10 designs, plus 10 details. Tutorial: WPF basic tutorial begins. You: present best sketch to class (I will photograph and project it) / Design crit. Homework: Continue coding; final sketches. Work on portfolio. to influence key press attributes like key repeats. visual non-textual output (can you paint with this keyboard)? sounds (can you use this as an instrument)? patterns (can you use this as a password system)? games controller (can you use this to create a very unconventional / novel game specifically designed around these properties, as was done with the WII)? what if it was under a foam pad, and people could walk and/or sit on it? what if it was placed in a pillow on a bed? what if it was under a tight shirt that a person was wearing? Would it capture them breathing? what if you could attach objects to each key or combination of keys (e.g., by clay)? Extended idea: generalize it to animate graphical design properties, to have them react to what you do. Immediate idea: Create a typing game between multiple people, where they have to coordinate their actions. For example, whenever a person presses a key, a bubble showing that letter appears, where the bubble size depends on the pressure. The other person has to type the same letterto match the pressure. If the two pressures stay the same for a certain amount of time, the letter is entered into a textbox (i.e., typed). If they don't, the bubble will pop.